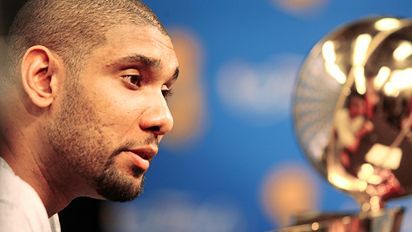 Melissa Majchrzak/NBAE/Getty ImagesTim Duncan might be the NBA's best player since Michael Jordan. Vote: What's next for LeBron and Cavs? Rank: Where does Spurs dynasty rank? Chad Ford and David Thorpe give a complete preview of the NBA Finals between the Cleveland Cavaliers and San Antonio Spurs. • In each of their three previous trips to the NBA Finals (1999, 2003, 2005), the San Antonio Spurs have won the NBA title. • This is the Cleveland Cavaliers' first trip to the NBA Finals. • Since 1983-84 the team with home-court advantage in the NBA Finals is 17-6. • Road teams are 16-44 all time in Game 1 of the NBA Finals (.267 win pct.). Of those 16 winners, only eight of them went on to win the title. • The team that wins Game 1 of the NBA Finals wins the series 71.7 percent of the time (43-17). All NBA Finals have been best-of-seven series. • Eight different players on the Spurs bring a combined 103 games of NBA Finals experience into this series. Only one player from the Cavaliers has previous Finals experience. That player is Eric Snow, who was on 1996 Sonics and the 2001 76ers (11 total games). Being whistled for traveling is a good thing in the playoffs. Where will you be watching? From your couch? Or from the high-intensity confines of a postseason arena alongside thousands of other adrenaline-fueled hoops junkies?